The admin templates presented below come with many components and features to start developing your next web project quickly. Let’s begin! Sing App by Flatlogic is an admin template created with React and the Bootstrap framework. It is a responsive template, fast and in high quality, making your web application run smoother, faster and easier to maintain and manage. With Sing you can build different applications, from a simple platform to a complex one for commercial or professional purposes. It comes with hundreds of pages included, 8 Charts libraries, 2 Dashboards, Static and Hover Sidebar, as well as an e-Commerce section, all of which make it easier to work with and also implement. The code is fully documented and it is quite easy to work with. It comes with 7 unique Google Map skins and 7 theme skins. Another great feature is SmartVoice, that will allow you to talk and customize voice commands, for easier use. This is a colorblind-friendly template, which helps users with different types of colorblindness. The timeline design is flexible, the chat is fully working, you can add and customize different widgets and have practically endless options of customization. It comes eCommerce-ready and Retina-ready, with RTL support and a clean, well structured code. It offers a full inbox view of Outlook, if you want to connect your Hotmail account. The documentation is detailed, breadcrumbs are automatically built and it is compatible with jQuery UI. 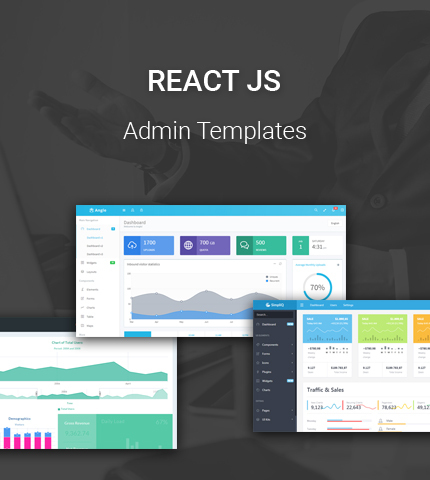 Powered by both ReactJS and Bootstrap, Rubix is an admin template that is suitable for both novice and experienced users. It is fully responsive and comes with an exclusive charting library, which is hand-crafted and touch-enabled, called Rubix Charts. Using Mozilla’s L20n library, it helps developers easily locate and access different languages, for better translations. You can code using different coding languages, whereas the template itself uses Node.JS for automating builds. A template for those with a business drive, SimpliQ by Creativelabs will make anything possible. It is built using Bootstrap 4, with ReactJS, AJAX, AngularJS, Vue.js and Static HTML, but comes with Bootstrap 3 version as well. There are numerous jQuery and other plugins, for both versions, such as: Flot Charts, Pie charts, Full calendar, dataTables, Dropzone.js. Apart from those, there are components like Datepicker and Font Awesome. There are also over 1000 premium high resolution icons, all for free. It is compatible for eCommerce use and works flawlessly on all well-known web browsers. As for responsiveness, it is fully responsive and works on any device. The developers pride themselves for the expertise with Bootstrap and continuously work on updating and optimizing this template. Proof of that, is the constant update releases twice a month. There are CSS3 animations, C3js Chart and Morris Chart, Google maps, Calendar and Data tables. It supports alerts and notifications for any activity on the page and comes with Weather icons and Simple line icons. You can choose from the numerous theme colors or create your own with ease. The landing page included helps you get started in the easiest way. You can create nestable lists, upload and place media in the desired places, keep track of all activity on the page. These include visitors, earnings, mail and sign ups. This is a fully responsive template, compatible with any device and popular browser. Angle is a multiple-framework template by Themicon. It is a translation-ready, retina-ready and fully responsive template, which comes with bi-directional text support for both RTL and LTR view. There are over 90 HTML templates, multiple layouts and practically unlimited themes. It comes with Touch Carousel, Lightbox, Sticky and auto-hide navbar, Font Awesome icons and smooth scroll. The ReactJS version includes Webpack, hot-reload and React-router. 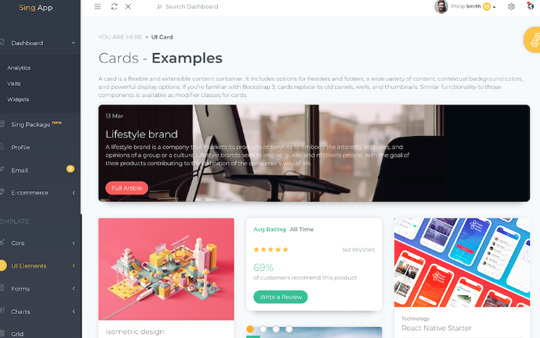 As for usage, it is a very versatile template as it can be used for personal and business use, it is eCommerce compatible, can be used for Single-Page applications, help desk, CMS, SAAS, and in many other projects. Apart from those, there are table plugins as well as chart libraries. The landing page will help build a front-end quickly and easily and the source code comes uncompressed and well organized. An ant design inspired template, Ant by Arousing is built with Bootstrap 4 and ReactJS. It is developer friendly and easy to customize. There are multiple layout options and color schemes, with 18 of those already predefined. It works with jQuery and comes with nested routing by using React-router. There is Lazy loading, Cross browser and High Resolution support. The design itself is fully responsive, as well as eCommerce-ready. It comes with multi-level menu, several chart models, different tables, forms and pages. Upon purchase, this template has free access to all future updates and comes with premium support. Next there is Eract, a template by Solution Portal, in a minimalist design. This is a beginner-friendly theme for developers and comes with custom-scripts, but without flux or redux implementation, which makes it easier to work with. There are various widgets included and it uses React Icons, which supports icons such as Font Awesome and typicons. For routing it uses React-router and comes with High Resolution and cross browser support. The navigation system is Ghost-like and the design is fully responsive on all devices. It comes with numerous pages and options to create and manage tables and charts. The Mail app comes with both mail and chat options and there are different buttons and typography options. It is a pretty straightforward template that comes with a quick-start guide included, as well. Also by Creativelabs, Genius is an excellent admin template, with an extensive dashboard panel. It includes over 1000 icons, jQuery plugins and different versions, using Bootstrap 3 and 4. An interesting feature is the calendar, which helps keep track of important occasions and works just like a digital agenda. There are numerous widgets for keeping track of traffic, income and all other activity. You will find different pages, options to create charts and forms, as well as plugins to customize the appearance of the site. It is responsive and compatible with all modern browsers. Genius Admin gets regularly updated and optimized twice a month.